I have the pleasure to review Gimme-Jimmy this year for the MCCBD that falls on January 27th 2016. The MCCBD mission is not only to spread the word about children's book diversity, but also to include multicultural books into classrooms. Book reviews is one way to support this initiative. Gimme-Jimmy is the perfect book to be used during bullying prevention week at school, at home or any time you need to go over social skills/manners with children. And I mean children of all ages! Gimme-Jimmy is a very good book to keep in all classrooms libraries and at home for future reference. 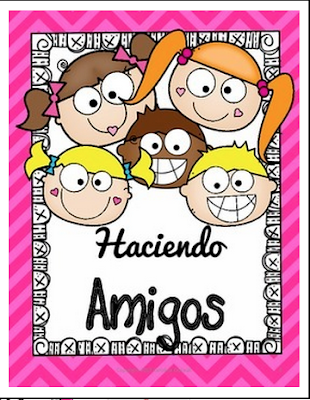 As I help to keep children engaged with the topic, I have created a product in Spanish. You can find it in my store in TPT. The file contains a mini book to write about friends and get to know new ones. The booklet can be used as a beginning of the school year activity, Valentine's Day or at any time you want. 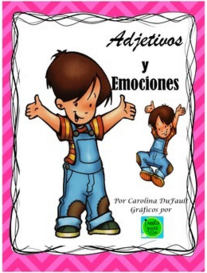 Another product you might find helpful to use is "Adjetivos y Emociones" which teaches children identify the different names for emotions and adjetives to describe their feelings. You can find it here. Mission: The MCCBD team’s mission to spread the word and raise awareness about the importance of diversity in children’s literature. Our young readers need to see themselves within the pages of a book and experience other cultures, languages, traditions and religions within the pages of a book. We encourage readers, parents, teachers, caregivers and librarians to follow along the fun book reviews, author visits, event details, a multicultural children’s book linky and via our hashtag (#ReadYourWorld) on Twitter, Facebook and their website. CoHosts: Multicultural Children’s Book Day has 12 amazing Co-Host and you can view them here. I'm so pleased to see Sherrill S. Cannon included for #ReadYourWorld! We absolutely adore her books, and this is one of our favourites. Thank you! Very fun book! Thank you very much. Looking forward to another MCCBD and write more reviews. Thanks for reviewing this book! I have read it as well and thought it was excellent. Happy Multicultural Children's Book Day! What a nice idea for a book and supplement! Thank you! Thank you very much! I think the book and the suplemental worksheets support each other very much. This sounds like a great book about a very important topic. And I love your related materials! Thank you! This is my first book review and I liked very much. I am new in blogging so any feedback is great for me.